Poms are in the air as the routine nears the end. Mackenzie Phillips, Skylar Sikes, Emilee Goldsmith, Emily Kuehl and Stella Steck bring the attitude and excitement to their routine during the Farmington Dance Invitational held Feb. 2. Emily Kuehl shows her spirit during the Farmington Dance Invitational. Twelve girls and and coaches make up the 2018-19 Fredericktown Gold Dusters. It is clear to all of them them that it is about more than the dance. "They have become like a second family to me," Coach Shannon Hovis said. "This year was the first time I have had to step away due to my maternity leave and I missed them just like they told me they missed me." Hovis said she wants nothing but the best for these ladies, and three of this year's seniors she has coached the last four years, one for three years. "It is going to be one of the hardest things to do, to let them go at the end of the season," Hovis said. "It wasn't a bond we made in just a year, it took us three, four years to grow into what we have." Hovis said she has watched these young women grow into adulthood. "They are going to do great things outside of high school and I know if I need them to come back and choreograph they would," Hovis said. What does being a Fredericktown Gold Duster mean? "To me, being a Gold Duster allows me to gain confidence in myself," Senior Gold Duster Hope Turnbeau said. "I started dancing my freshman year with little experience, on a team with girls who have danced their whole lives." Turnbeau said it took countless hours, long nights and extra practice with her coach to learn the routines, but because of her coach and teammates, she now has full confidence in herself as a dancer. "To me, being a Gold Duster allows me to do what I love with the girls I love," Senior Gold Duster Skylar Sikes said. "I've grown up with most of these girls and getting to combine the two means everything to me." 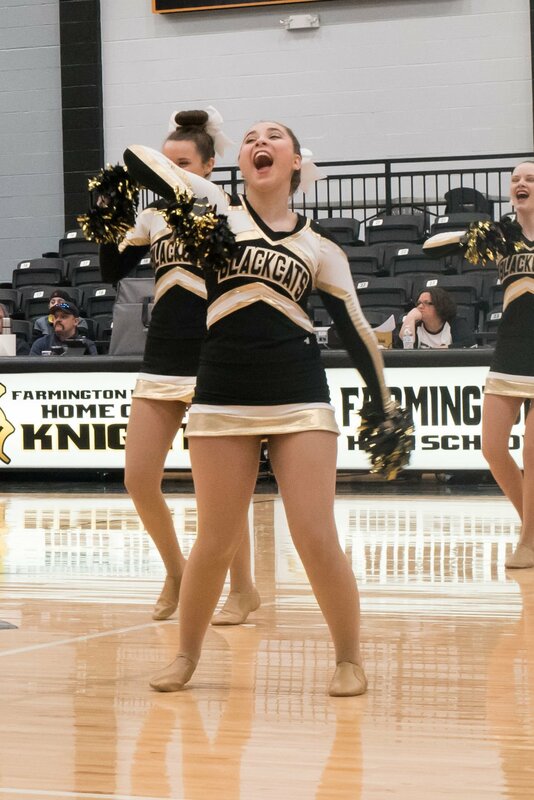 Sophomore Gold Duster Emilee Goldsmith said Gold Dusters means many things to her, including the close friendships she has made with the other dancers. "They will always be here for you, anytime," Goldsmith said. "If someone is sad or has had a bad day, they are always there to cheer you up no matter what." Goldsmith said she has always loved to dance and performing for people brings her joy. "Just having a 'family'-like team there for you during high school is so amazing," Goldsmith said. "I am so glad to be a part of something like this." Gold Dusters have the longest season for any sports group with tryouts in May, camp in June and the season being from August to February. "The girls learn anywhere from 10 to 12 routines a year," Hovis said. "We learn them, clean them up and perform them two to three times." The team can be seen at half time during both the home football games and home basketball games. "We are your football and basketball halftime entertainment," Hovis said. "We also attend at least one dance competition in January. It makes for about 30 performances with the two sports seasons, basketball being our biggest season." Hovis said the team also performs at the Arcadia Valley Thanksgiving Tournament, Central Christmas Tournament and the MAAA tournament at Mineral Area College. "Dedication is key," Hovis said. "I am dedicated to them just like I expect them to be dedicated to this team. I express that and push that all year long." Hovis said she is honest with the girls and if they do not know the routine well enough they will sit out. "I have had to do that," Hovis said. "They don't like it, and they still have to dress out and show up to the game. Therefore, they are having to work on it at home or with another teammate making sure they have the dance down." Hovis said most everyone wants to be up front and center and to get there they better know the routine. "It takes every one of the girls to do their job for them to do good," Hovis said. "I notice each year how great my group of girls are willing to work with each other and accept each other for who they are." Hovis said there have been moments when parents could not attend performances and the team really stepped up and held each other up. "I had a dancer that didn't know if she would have someone for parent night able to attend," Hovis said. "I had one dancer that said 'my parents will walk with you,' another said 'we all will walk with you.' That meant so much to me because deep down my heart hurt for her." Hovis said in the end the parents were able to make it, but that she loved seeing how the team came together to try and find a possible solution especially since all the solutions were so very sweet. "They build one another up on a daily basis even if they don't realize it," Hovis said. Hovis has been coaching for four years but began dancing when she was three and spent all of her high school years dancing for her school team. "I always wanted to coach my high school dance team," Hovis said. "Since I don't live in that town anymore, I am very thankful to get to coach in what I call now my hometown." Hovis said she used to say music makes her happy, and it still does. "I just don't get to dance around like I used to," Hovis said. "That is why coaching brings me so much joy. I am very thankful to be allowed this opportunity to coach them and hope to continue for many years." The Fredericktown Gold Dusters participated in the Farmington Dance Invitational, Feb. 2 at the Field House in Farmington. The team took second place in Hip Hop, third place in Jazz and third place in Pom. "I am so proud of these young ladies," Hovis said. "They danced their hearts out and performed the best they have ever done not only in our routines but also in our placing."